Analytical Chemistry: Developments, Applications and Challenges in Food Analysis represents a collection of book chapters showing the validation and instrumental set up of analytical methods that are used to analyze foods and their ingredients. The different chapters include several topics discussing the validation of analytical methods, extraction procedures, and other multidisciplinary approaches for the analysis of foods, particularly supplements originated from raw plant materials. In these book chapters, we would like to collect different methods and tools to provide a multidisciplinary approach for the analysis of foods, their ingredients, natural and synthetic supplements. 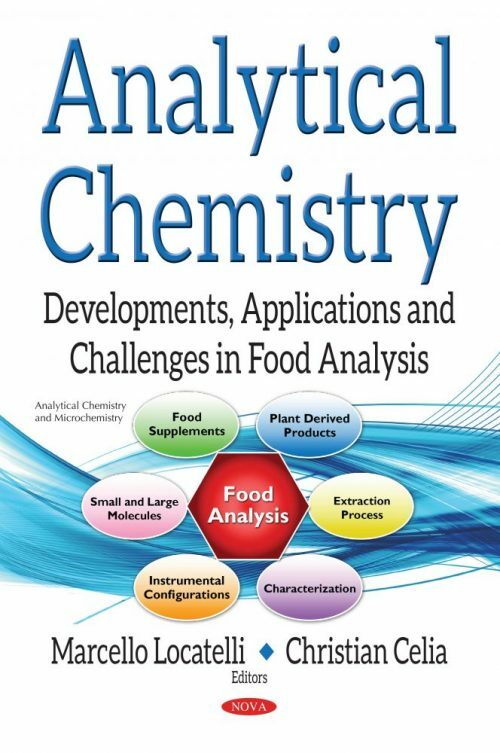 The book includes preliminary approaches used to validate analytical methods and a detailed description of the various matrix effects that disturb the analysis by using the hyphenated techniques, sample preparations, and a complete overview of principal phenolic constituents, until the use of instrumental configurations able to characterize foods (NMR and its applications). The use of voltammetry and atomic absorption spectroscopy for toxic metals in seafood, food supplements, the application of thermal techniques and innovative approaches in the analysis of proteins in foods and food supplements are included. Chapter 9. Thermal Techniques and Their Applications: Taking Advantage of the “Heat of the Moment"
Audience: Analytical chemists and researchers working in the field of validation methods, foods and food supplements, and using standard and innovative instruments to analyze products; and/or innovative extraction procedures, could be a potential audience of this book chapters.